The LEGOLAND Discovery Centre in Birmingham currently has a veritable smorgasbord of polybags for sale, including a number of 2019 releases. I had the opportunity to visit at the weekend so I availed myself of the opportunity to acquire them. 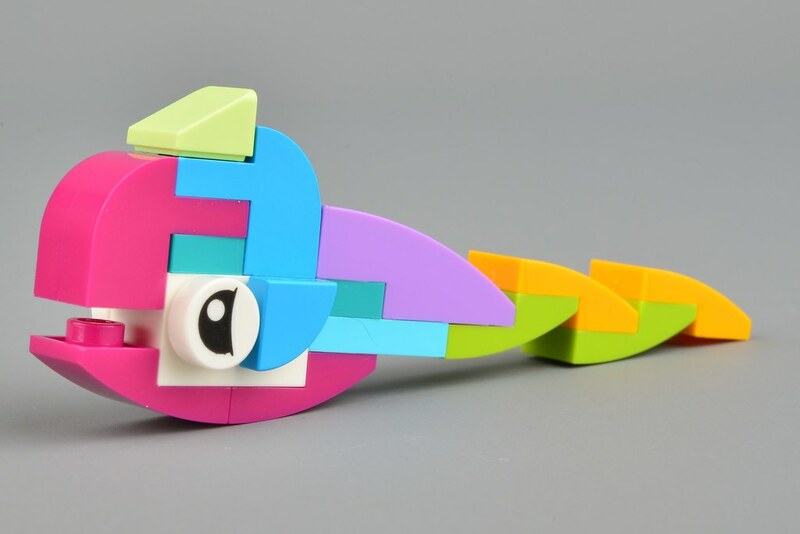 Among them was 30545 Fish Free Builds - Make It Yours, which costs £2.50 for 39 parts. It might not seem like terrific value but it provides a lot of fun. 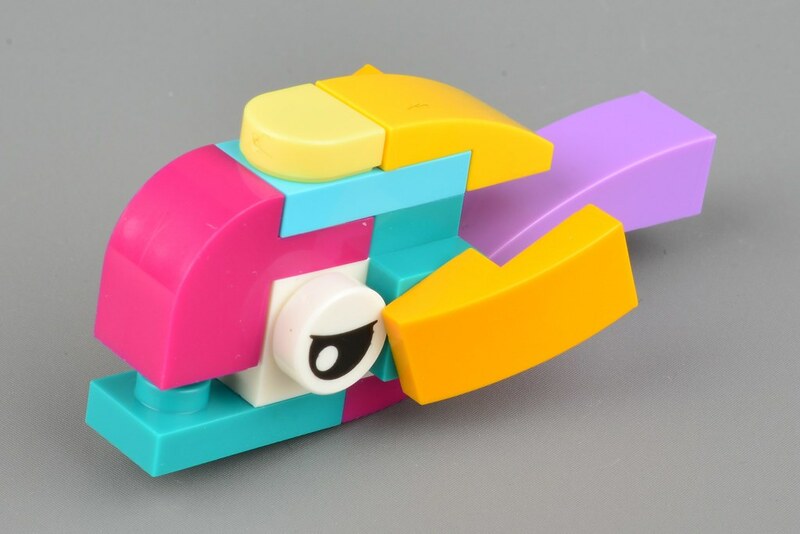 The idea of the set, as you can probably tell from the name, is to build fish. Instructions are not provided but a sheet with inspiration is. It's not hard to build the examples, thanks to the colour coding of the parts, should you wish to. 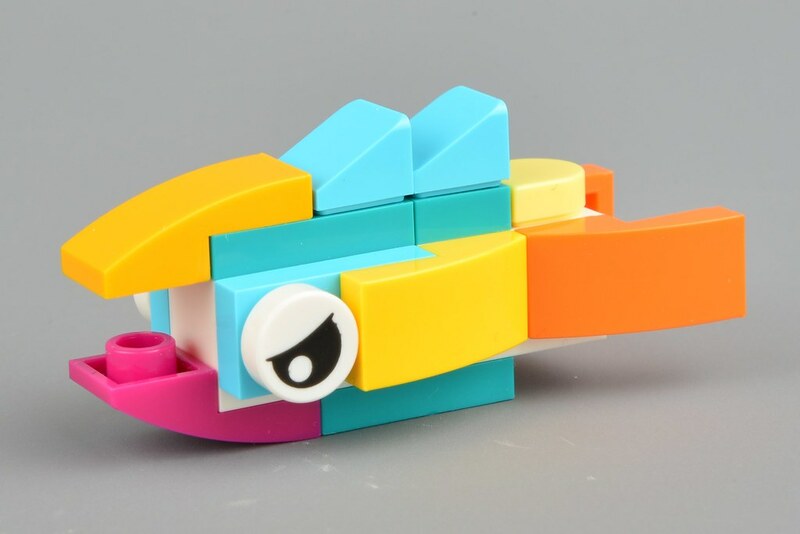 OK, so they are not going to be troubling the editors over at Brothers Brick any time soon but it was fun to fiddle about and create models that passed for fish with just a handful of rather nice colourful pieces. What’s the mystery fish? Drumroll please. Random polybags can be fun. I impulse bought a couple of friendship flowers recently just to play around with only using those included pieces and made some abstract sculptural thingys while watching TV. Something I realized lately is that Medium Lavender has been extremely scarce in LEGO Classic sets, as well as sets like this and Go Brick Me. I'm not sure why. I hope they add more of it now that LEGO Elves has been discontinued. 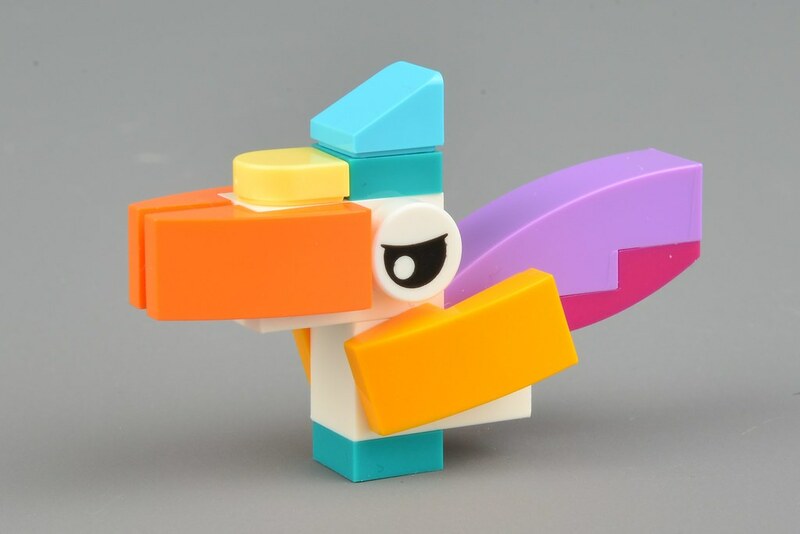 I might pick up this polybag if I find it at a decent deal, it looks fun and I love the colors that are included. Polybags are generally pretty poor value where I live. @Your future president: If I had to guess... "Yours"? I have 2 of those small boxed 10401 Rainbow Fun sets (2018). 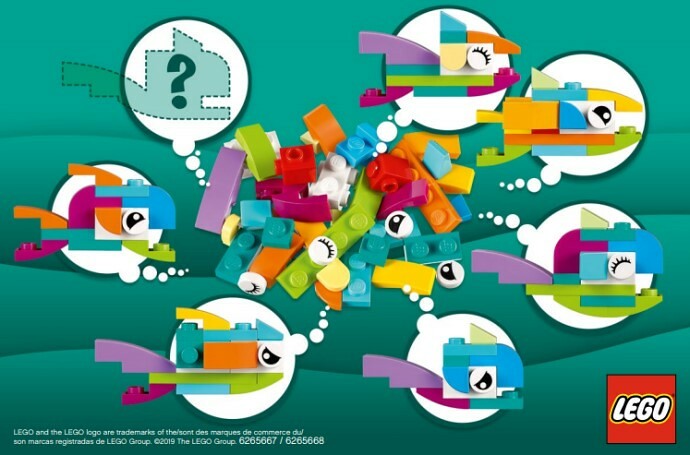 While it has instructions, the "Building Bigger Thinking" line did promote self-made builds. So this looks like a fun little set to me. That's a very nice selection of useful parts in fun colors. I love close enough to Birmingham so next time i mindlessly wonder Birmingham’s city centre while my mom is in Harvey Nichols i’ll walk down there and pick this and a few other polys up. Ha ha, it does totally sound like it should be free! LOL! 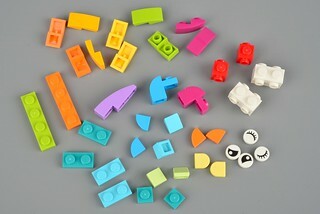 Totally looks like a Classic set with the wide range of colors, and printed eye pieces - which I really like! By the way, do any of you guys know if this polybag is supposed to be LEGOLAND exclusive, or anything like that? If not, hopefully I would be able to buy one or even several of them at one of my local Walmart. By the way, @Huw, great review and fish builds! But love all the colours it's nice to see lego in teal again aswell.. They're not "free", they're "fish free"! Big difference. While most fish today contain plastic, it's comforting to know that at least our plastic doesn't contain fish. Way to go, Lego! 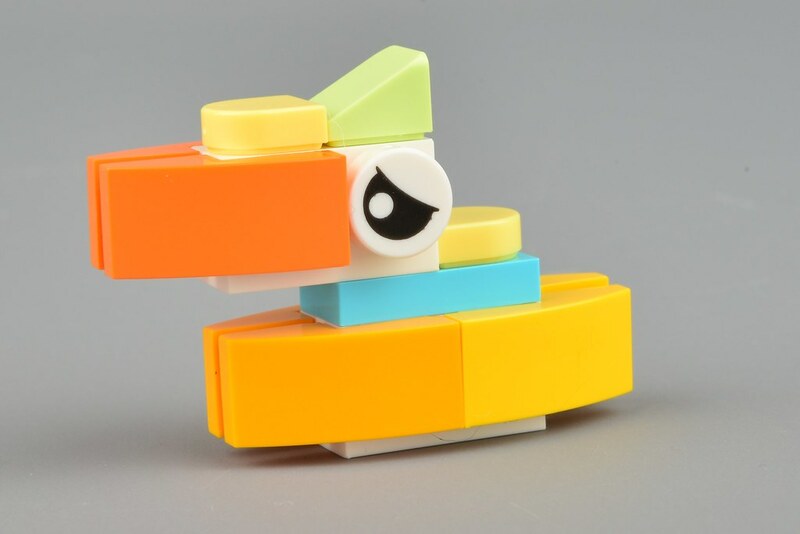 This reminds me of the fish building area at Lego House. My kids had so much fun building and then transferring them to the virtual tanks!! Found this polybag for $2 and bought one. Love the part & color selection. Even built a few fish using the round printed eyelash tiles as gills. Went back & bought 4 more to have even more choices. I want a couple of this just for the parts, such a vibrant collection! Especially that teal blue. A shame you don't seem able to build to many of them at once, but those eye pieces are always handy! If you can build fishes out of it, it is definitely not fish free! It is spaceship free, or gas station free, but surely not fish free. Maybe it's "free" as in the sense of unrestricted, i.e. nothing you're meant to be doing other than making fish. Definitely a stupid name for a set, but what a wonderful little "bag-o-parts". Nice colours, your duck looks so sad it’s almost heartbreaking. I'll take that as a complement! 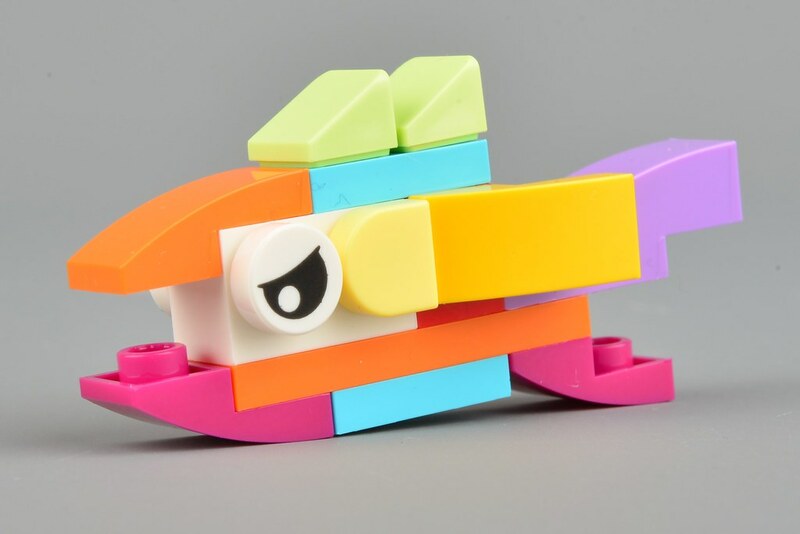 I should think that the phrase Fish free builds should have a comma after Fish and that free build means without instructions and using your imagination. Yes I'm not the only one that noticed that!! !